This 12 oz. blue and white ceramic mug is a perfect gift for your favorite Southern Jewish coffee lover! Limited Edition Shalom Y'all print painted by local Mississippi artist Jackie Ellens. 24" x 8.5". Shalom Y'all 16 oz. Double Wall Acrylic Tumblers with Blue Straw and Screw-on Lid. Can be used for hot and cold liquids. Also features the ISJL logo. This adorable onesie makes sure the babies in your life say “y’all” from the start! 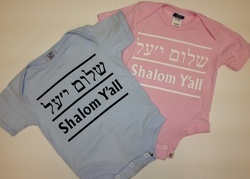 Start your little one off on the right southern Jewish step — adults are sure to coo over its witty message too! Highest quality 100% cotton, 3 snap crotch and finished sleeves and hems in bright and baby-friendly colors! ​By request, we are thrilled to offer a Shalom Y’all travel mug! Dual-wall insulation, frosted blue acrylic outer and a leak-resistant stainless steel lid, this tumbler will stand up to all life’s adventures. Ceramic. 3" x 6." Can be used as a trivet or wall hanging. Gray or navy, 100% cotton. Adult sizes: M, L, XL, XXL. Front design: "Have You Had A Southern Jewish Experience Lately?" Back design: "I Am A Southern Jewish Experience"
Available in Navy or Khaki. 100% Cotton with adjustable back. The perfect windbreaker to show your Southern Jewish pride!